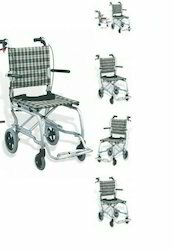 Manufacturer of a wide range of products which include travel wheel chair and lifting wheel chair for medical clinic. Easy to carry in flight. Backed by a team of skilled and experienced professionals, our company brings forth Lifting Wheel Chair for Medical Clinic. Manually operated, these comfortable wheelchairs are suitable for curative and preventive care. Scientifically designed, the offered selection comes with brakes and a foldable footrest. We offer these wheelchairs in a varied range of specifications, to meet various client needs. Looking for Lifting Wheel Chair for Medical Clinic ?